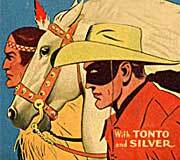 Originally titled (GHOST) RIDERS IN THE SKY – A Cowboy Legend, Stan Jones wrote this song sitting outside his Death Valley home on his 34th birthday. A classic that has been recorded countless times since 1949 and topped the country and pop music charts. This version draws its inspiration from The Shadows and I added some harmonica lines and ghostly slide guitar. I grew up watching television’s Cartwright family and their adventures on the Ponderosa ranch. I can’t hear the BONANZA theme without imagining a map of Nevada bursting into flames. Guitarist and session legend Tommy Tedesco, one of my heroes, played the original version in 1959. I was faithful to the arrangement, save for adding a little banjo and some brushes. The LAST COWBOY WALTZ has a long history. In 1979 I produced an album for vocalist Terry Gordon entitled The Last Of The Marrickville Cowboys and I wrote a series of 4 themes (vocal and instrumental, inspired by Willie Nelson’s Red Headed Stranger album) for Terry’s record. Shortly afterwards, Sydney radio station 2KY used one of them for a radio promo. 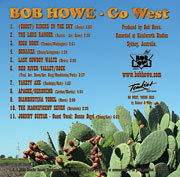 The closing theme was the Marrickville Cowboy Waltz which I rearranged and recorded here. This arrangement first appeared on BBC 2004 Bondi Band Compilation, a local promotional CD for Bondi’s best music store – Intermusic. In 2006 I was delighted for the track to be chosen for inclusion on the compilation CD ABC Radio’s Saturday Night Country Hottest Hits Volume 2, released nationally on the ABC Country label. RED RIVER VALLEY/ROCK is based on a combination of the old folk tune believed to have been written around 1870, and the lively 1959 reworking by instrumental band Johnny and the Hurricanes. Where they played it on the Hammond organ, I perform it on the mouth organ, complementing the campfire version with which I start this track. Homer Louis Randolph III, better known as Boots, wrote ‘Yakety Sax’ with James ‘Spider’ Rich and hit the charts with his saxophone version in 1961. Guitar maestro Chet Atkins had his first Top Five hit in 1965 with a reworking of it, retitled YAKETY AXE, using guitar player’s slang; axe=guitar. These days it is most remembered as the closing theme to the Benny Hill television show. Another combination – APACHE/GERONIMO; first the Jerry Lordan composition APACHE, recorded by Bert Weedon but later made into a number one hit by U.K. band The Shadows in 1960. U.S. singer Sonny James also had a hit with a vocal version and there is a surprise inclusion of a few lyrics here. GERONIMO was composed later by Hank Marvin of The Shadows and was a hit for them in 1963. Originally recorded for the compilation album Tomkins Showcase Volume One, DIAMONDTINA YODEL is named after my guitar and also an instrumental approximation of country style ‘blue’ yodelling. 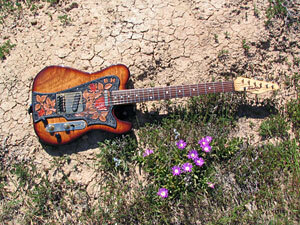 I play a Tomkins ‘Diamondtina II’ model made from Australian woods. 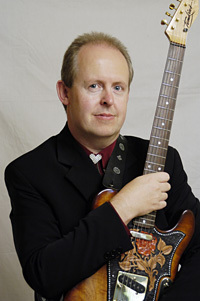 You can learn more about my guitar and watch a video of me playing Diamondtina Yodel to open the 2005 Tomkins Guitar Showcase in Tamworth – CLICK HERE. 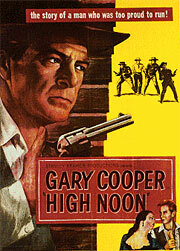 This track begins with the opening flourish from the original movie title version by Elmer Bernstein for THE MAGNIFICENT SEVEN movie. It then segues into the popular arrangement of the tune we all know and love, transcribed and orchestrated for me by my good friend and legendary rock ‘n’ roll drummer Leon Isackson. Thanks Leon! 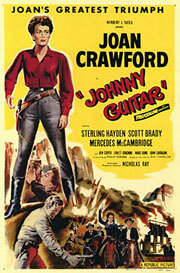 Victor Young wrote the music for the 1954 film JOHNNY GUITAR which starred Joan Crawford, Mercedes McCambridge and, in the title role Sterling Hayden. I begin here with the opening orchestral theme transcribed from the movie. At the very end of the movie, Peggy Lee sings a few lines of the lyrics she wrote for the main theme. She later recorded the whole song and it is sung here beautifully by the award-winning Australian vocalist Donna Boyd (pictured, right) who also sang harmony with me on APACHE/GERONIMO. Thanks Donna for making my album special. The theme would later be an upbeat hit instrumental for The Shadows, The Spotnicks, Ricky King and many others including Aussie band The Leemen who earned a gold record when their 1960 version topped the charts. The last part of the track is inspired by all their versions. GO WEST, YOUNG MAN was written by Bert Kalmar and Harry Ruby and performed by Groucho Marx in the 1947 film Copacabana which co-starred Carmen Miranda. 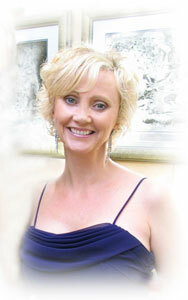 Both the cover photos were taken in Mildura during the 2005 Country Music Festival. While scouting around for a location, I realised the ground where I was standing made a wonderful setting for my guitar – the cracked scorched earth still showed promise with the purple flowers growing wild – so I simply lay the guitar down and snapped away. 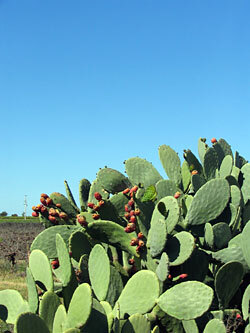 The prickly pear on the right put me in a Go West, cactus sort of mood and the clear sky was a perfect backdrop for the song titles on the back cover. 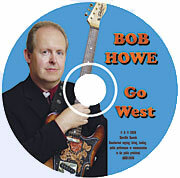 The photo of me on the disc itself was taken by the late Calvin Winetroube, photographer and musician, sadly missed by friends and colleagues. 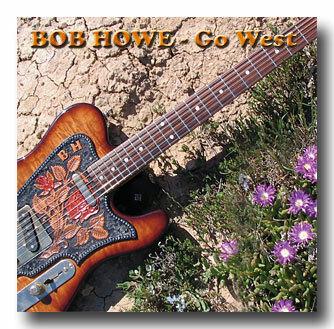 I produced and recorded GO WEST at Kenilworth Studios, Bondi Beach, Sydney, Australia, playing an Australian made Tomkins electric guitar and Tomkins electric bass, plus assorted brands of acoustic guitar, classical guitar, mandolin, banjo, harmonicas, keyboards and percussion. 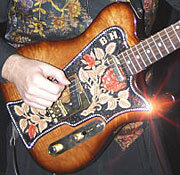 Thanks to Brent and the team at Bondi InterMusic, Oxford Street West, Bondi Junction for the best gear. The album was manufactured and printed by Peter and Clive at MadCDs. Thanks guys!